As important as any of the feast days commemorating the exalted saints of the Church is the feast day held annually on September 14 in special tribute to the cross of Jesus Christ, the reproduction of which is worn or displayed in every corner of the earth as a symbol of the mightiest faith in all the universe. The Emperor Constantine the Great was not only the first Christian emperor, but, together with his mother, has been honoured with sainthood. His mother is honoured for her determined efforts in the cause of Christianity. It was Constantine who beheld a vision in the sky on which were emblazoned the words 'en touto Nika', translating into "In this Sign Conquer," etched across a brilliant cross of Jesus Christ. Ordering that all the shields of his army bear the sign of the Cross, Constantine went on to subdue the enemies of the state and to establish the Christian faith, which has outlived his empire and will endure forever. Helen, the mother of Constantine and a saint of the Church, had the full support of her son when she decided to recover the cross of Christ, and although nearly three hundred years had elapsed since the Crucifixion, she was optimistic in her resolve to find the Cross and return it to the city of Constantinople. After months of diligent search, painstakingly following every historic clue as to its whereabouts, Helen and her dedicated group of searchers discovered the Cross on 14 September 325 AD in the vicinity of Golgotha, where it had been buried in the dust of the centuries. On the spot where the Cross was discovered there was found to grow a hitherto unknown flower of rare beauty and fragrance which has been named Vasiliko (Basil), meaning the flower of royalty, out of respect to the Dowager Queen who led the expedition. This flower, since that memorable day over 1600 years ago, has been the official flower of the Orthodox Christian Church and is in evidence when Clergymen engage in the age-old tradition of blessing homes or the waters on which seamen ply their trade. Helen afterwards made countless pilgrimages to the Holy Land and was responsible for the establishment of churches at the sites of the Nativity, Holy Sepulchre, Ascension, and at many other places. For the next three hundred years the Cross stayed in the possession of the Christians in Jerusalem, but after a series of forays the city of Jerusalem was captured by the Persians in 614 AD and the Cross fell into the hands of an enemy that for years prior and since has scoffed at the faith of Jesus Christ. Several attempts were made by devout and bold Christians to recover the precious Cross, but they were no match for the Persian hordes. Finally, the Byzantine Emperor Heraklios, in the tradition of his ancestor Constantine, amassed an army of size and equipment to match that of the Persians, and after months of planning, launched an attack on the Holy City - but with no immediate success. What the Persians lacked in faith they made up for in numbers of trained warriors who respected nothing but the sword, and because of this relentless defence the tide of battle wavered over an agonising fifteen years until at last the Christian forces broke through the Persian defences and regained control of the Holy City and its priceless treasure. 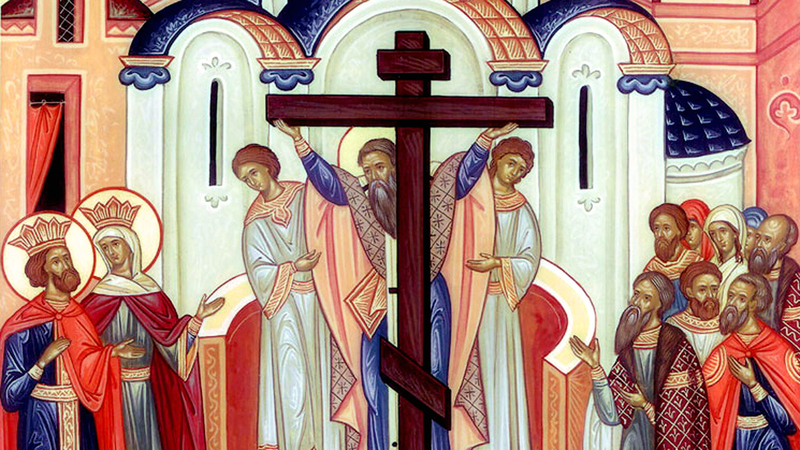 The successful outcome of the campaign is celebrated jointly with the finding of the Cross by St. Helen on September 14, and the veneration of the Precious and Life-giving Cross is again celebrated by Christians on the Third Sunday of Lent. With the sign of the Cross so much in evidence in the daily life of a Christian, the celebration seems to extend over every minute of every day of every year, but the official days underscore the magnitude of the Cross in the Christian concept. With the perilous conditions prevalent in a land where the fortunes of a menaced society were subject to sudden change and mood, depending on who held the upper hand, the Fathers of the Church decided to divide the Cross into small sections, thereafter to repose in the safety of the great spiritual centres of Constantinople, Mt. Athos, Alexandria, Rome, and Antioch.